No one is really enjoying this latest prolonged blast of cold weather. We are all stuck inside doing our best to keep ourselves (and our kids) entertained and warm. We must have been due for this as we have been spoiled with mild winters the last few years. So, those mild winters, along with other things, have encouraged an increase in insect populations we have seen in our trees, shrubs, perennials and lawns, right? This arctic blast will surely help reset those bloated insect populations, correct? The answer to those questions is complicated. This is because many insects have adapted ways of making it through a cold, harsh winter. Migration, hibernation, freeze tolerance (insects can produce an anti-freeze to keep them safe) and freeze avoidance are just some of the ways insects make it through. 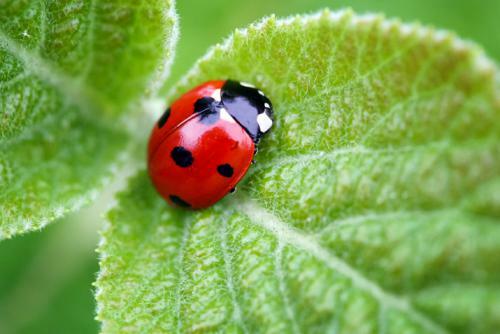 In many cases it is the spring weather and not the winter weather that can determine the fate of insect populations. For example, warm early springs can encourage insects to leave their winter hiding spots to search for food. If this is done too early there is not enough new plant growth for insects to feed on. This can lead to insect starvation. On the other hand, a cold spring will keep the insects in hiding longer which means they could miss one or two reproduction cycles. This leads to lower populations until summer. Just like baby bear’s porridge and rocking chair the conditions have been “just right” the last few springs for insect population growth and has not been greatly affected, one way or another, by our mild winters. Heavy spring rains can also impact insect populations. Spring rains will increase mosquito and aphid populations that need the water to reproduce. However, heavy rains will decrease grasshopper (because their dormant eggs laid in the ground get saturated with water and rot before they hatch) and spider mites populations. The, sort of, good news is this prolonged artic cold should cause some insect die back. The issue is, when talking about dieback, is this dieback not only effects “bad” insects, but the “good” ones as well. To make it through the winter bees flutter their wings, shiver and are in constant motion in the hive to produce heat for the hive and most importantly, the queen. Due to this constant motion bees need to eat a lot. A bee hive can go through thirty pounds of honey in a winter. If they run out of honey or it gets too cold the hive could lose their queen which effectively kills off the hive. So, where the mosquitos and aphids might experience some dieback so might the bees. Nature is a balance and we must be careful what we ask for. Every year brings something different and it is our job here at ILT Vignocchi to study those treads so we know what to look for from year to year. We will know more when spring arrives what these temperatures did to the overall insect populations. This entry was posted in ILT Vignocchi, Integrated Pest Management, Maintenance and tagged environment, horticulture, ilt, iltvignocchi, insects, Integrated Pest Management, IPA, landscape, landscapers, maintenance, pests, tips on January 11, 2018 by iltvignocchi. © 2019 ILT Vignocchi. All rights reserved.